This little All American will definitely be the star in your collection! 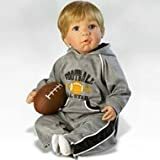 He looks as real and as cute as you can get in his little gray sweats complete with All Star emblem and football. Future Football Star is approximately 19" and comes with accessories shown, a numbered Certificate of Authenticity, and a collector's box. Artist: Pat Moulton. This chubby baby is so lifelike you will never want to put him down. No detail was overlooked from his traditional sailor suit in pale blue with white pinstripes to his crisp white sailor hat. This is the perfect picture of a baby boy. "Sail Away" just might bring back joyful summer memories. "Abigail" is costumed in a pastel pink, teddy bear footed fleece onsie and "Aidan" in a blue and white striped fleece onsie each with cute appliquéd bear on the front. Their cute and cuddly "preemie" size features our popular weighted body that is perfect for cuddling close! Lil' Jingle Jill - 19-Inch Christmas Lifelike Vinyl Baby Doll (Artist: Michelle Fagan) by Paradise Galleries Dolls. This little cutie is dressed and ready to celebrate "Baby's First Christmas". Costumed in a soft cotton romper accented with red & white polka dotted bows and coordinating jingle booties, her tender expression is one of wishful thinking and anticipation! The best part...when the holiday has passed, you can remove her bib and she's all set for a day of play! This little cutie is dressed and ready to celebrate "Baby's First Christmas". Costumed in a soft cotton romper accented with red & white polka dotted bows and coordinating jingle booties, her tender expression is one of wishful thinking and anticipation! The best part...when the holiday has passed, you can remove her bib and she's all set for a day of play! Truly tomorrow's treasure today, "Lil' Jingle Jill" is a treat you deserve right now. This Premiere Edition will be issued to just a handful of collectors and will disappear as quickly as your own baby became a toddler. Don't wait - order her today and love her forever!" "Lil' Jingle Jill" is 19" from head to toe and comes complete with accessories shown, numbered Certificate of Authenticity, and exquisite collector's box. Artist: Michelle Fagan. EXCLUSIVELY for Paradise Galleries by renowned artist Dianna Effner, announcing the arrival of "Baby Hugs!" This beautiful baby girl is costumed in a soft pastel pink floral embroidered jersey knit sleeper with sweet lace elastic headband and completing the ensemble, a baby bunting blanket! You won't be able to put this sweetheart down once you bring her home to your house! Hand Painted Hair. (Scale accessory not included). 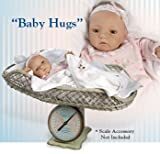 Weighted body for a "real" baby feel!